A little while back Rennie Heartburn kindly asked me to take part in a fun recipe challenge, Cooking Through the Decades. The idea of the post is to recreate one of my favourite and iconic recipes of a from a decade of my choice. Two of my all time favourite recipes sprang mind; Prawn Cocktail and The Knickerbocker Glory. Not in the same dish though, hehe. Both still all time favourite recipes of mine which I discovered in the 80’s. Knowing me and my children well, we would both pick out the sweet recipe first every time. So I pick a special back to school treat for them! 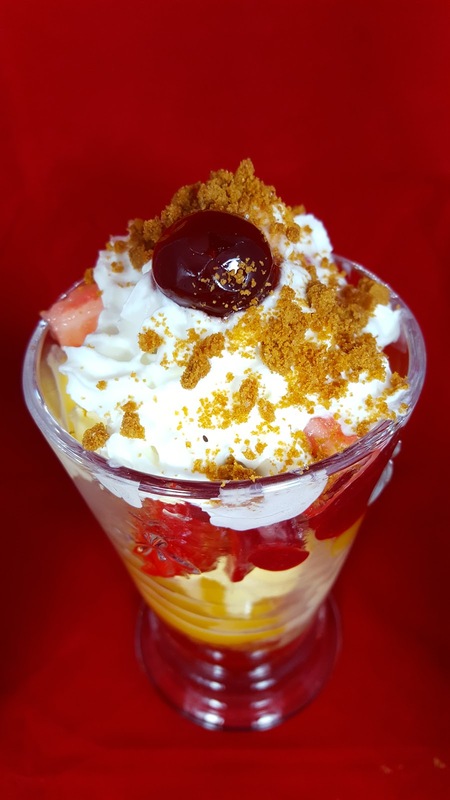 The Knickerbocker Glory was first described in the 1920. 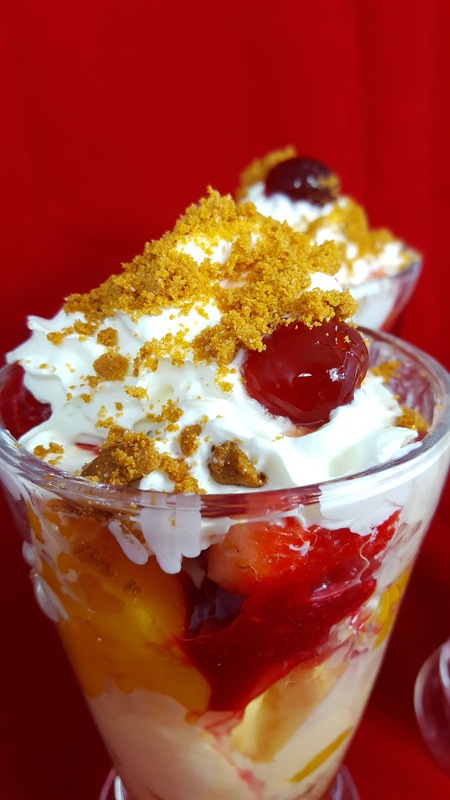 They consists of layers of fruit, ice cream, fruit syrups, whipped cream and a cherry on top. 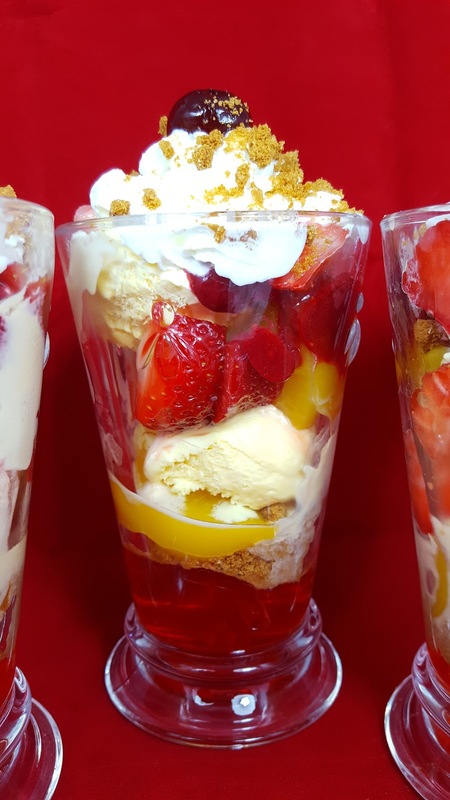 All served up in a tall glass and eaten with a long teaspoon. 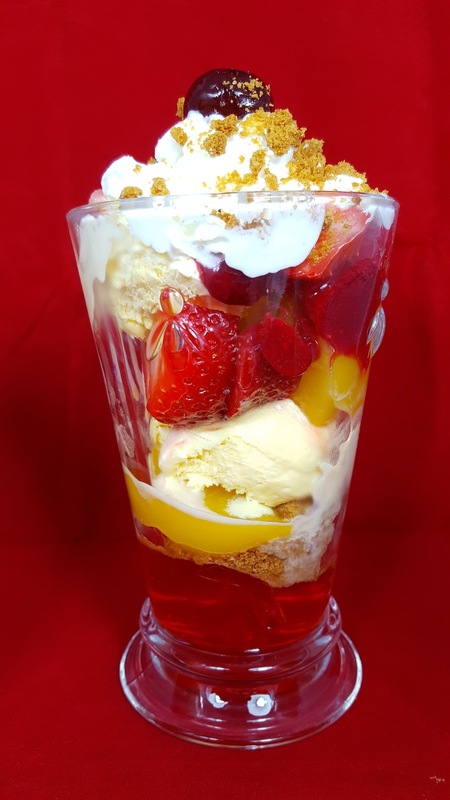 I remember having my first ever Knickerbocker Glory at around 13 years old. We were on holiday in Blackpool. We had been out for the night, most properly finishing off our night in the slots ( as a child that was my favourite thing to do in Blackpool!) and walking to our hotel. I could not believe my eyes when we walked by an ice cream parlor, open and full of people eating ice creams. I just gazed inside. “Ice cream being sold late a night.! ?” I can imagine my eyes were sparking! My dad said, come on lets go and try one. Oh my… It tasted amazing… I felt so lucky! 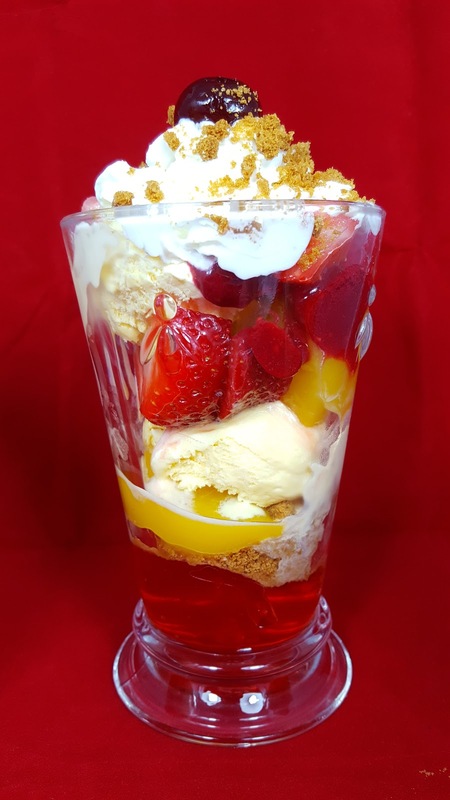 Here is my take on The Knickerbocker Glory . We all loved them. They tasted great. My daughter keeps asking “when are you making them again mum?” “Just wait till we go shopping” I replied!! Defrost the raspberries before using. In a smoothie maker/blender, place the defrosted raspberries and icing sugar into and blitzs until smooth. Sieve to remove all the little seeds and set aside. Chop the peach slice, set aside. Wash, hull and chop the strawberries, set aside. Place the biscuits into a food bag and bash with a rolling pin to make into crumbs, set aside. Ready to get the ice cream out the freezer and start layering. In the bottom of the glass share out the ready made jelly into all 4 glasses. Next layer up all the ingredients into all 4 glasses. 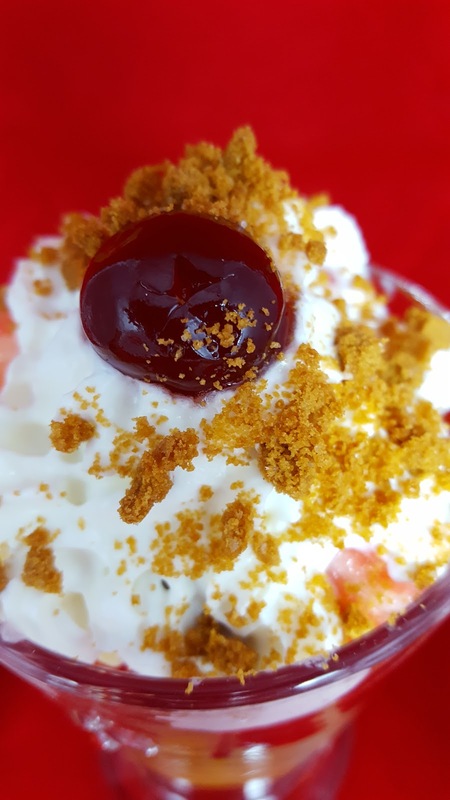 Half the biscuit crumbs, half the peaches, 1 scoop of ice cream into each, half the strawberries, the other half of peaches, another scoop of ice cream, other half of strawberries, drizzle the raspberry sauce on top of each, add the squirty cream, place a cherry on top and sprinkle rest of the crushed biscuits. Do you like treat like this? I got sent a voucher to pick up some ingredients as part of the Cooking Though The Decades campaign. All thoughts are my own. I was not paid for this post. "Pistachio, Oat And Cranberry Breakfast Pancakes"
This sounds so good! I love the idea of choosing something from a favorite decade! Thanks Heather, I am going to recreate lots of my favourites now!! Tasty and delish as always with your recipes and meals. Please do come by tomorrow morning and linkup a beauty/style/fashion/shopping post with me. I promise you will like tomorrow's post. Thank you and Happy Hump Day! This sounds so tasty!I would love for you to share this with my Recipes, Crafts, Tips and Tricks Facebook group: https://www.facebook.com/groups/pluckyrecipescraftstips/Thanks for joining Cooking and Crafting with J & J!